As threat of ‘no-deal’ continues, SMMT launches new Brexit Readiness Programme to help safeguard UK’s automotive supply chain as cliff-edge looms. Initiative highlights contingency planning minefield, with changes to regulations, onerous customs processes, tariffs and restricted access to talent among complex challenges facing industry. UK Automotive repeats call for orderly withdrawal and transition as risk to auto suppliers highlighted at SMMT Regional Forum Midlands. The Society of Motor Manufacturers and Traders (SMMT) today launched its new Brexit Readiness Programme to help the industry, especially SMEs in the automotive supply chain, prepare for the UK leaving the EU. With less than six months to secure a withdrawal deal and concerns of a cliff-edge on 30 March, the programme is part of ongoing efforts to provide support for small and medium sized member companies at this critical time. 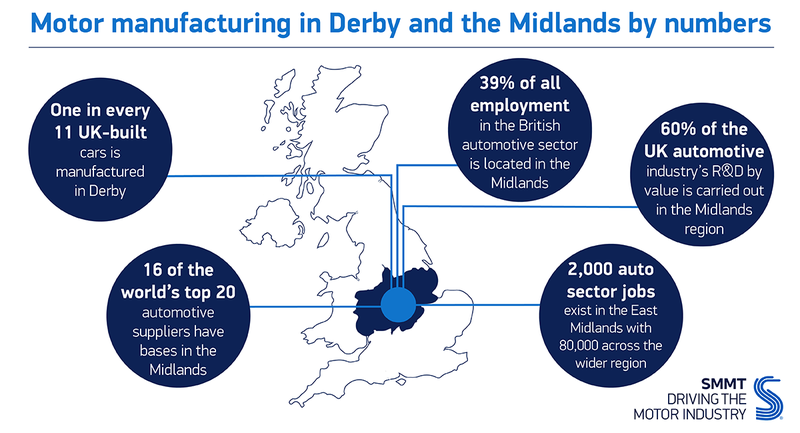 While vehicle manufacturers and larger tier-one suppliers all face the significant challenge of Brexit, the vast majority of the UK’s automotive supply chain companies are SMEs, with 69% employing fewer than 10 people.1 These firms represent the backbone of the entire sector, yet not all will have the resource to prepare adequately for the dramatic and immediate change to trading conditions between the UK and EU in the event of a ‘no-deal’ Brexit. In this scenario, there will be new, potentially unfamiliar requirements for businesses. Calculations as to the value and proving the origin of goods will have to be made and there could be delays to the movement of components into and out of the UK which may require warehousing or changes to raw material stocks. New customs arrangements will present a particular challenge, not least the increased paperwork and time required to fill in more detailed customs declarations – customs guidance alone on moving goods outside of the EU stretches to some 88 pages. Furthermore, there could be cashflow implications associated with the payment of tariffs and other taxes. Phase one of SMMT’s Brexit Readiness Programme sees five global brands from the legal and accountancy sectors join forces with SMMT to offer expert advice and consultancy services to members, including a free helpline for Brexit issues.2 These include trade and tax arrangements outside of the EU, customs procedures and adapting to regulation changes from chemicals to data protection, employment law and immigration. A strong local supply chain is the backbone of any manufacturing sector, and ours has thrived thanks to massive reshoring efforts and the ability to trade freely and frictionlessly with the EU. A ‘no-deal’ Brexit could have devastating consequences. With the clock ticking on negotiations, businesses must plan for all eventualities, including the worst. Our new support package seeks to mitigate the threat of ‘no-deal’ by helping businesses navigate the complex trade realities of a post-Brexit landscape. SMMT’s Brexit Readiness Programme was launched today at the Society’s Midlands Regional Forum in Derby as part of nationwide engagement to help support businesses of all sizes across the country. Around 200 vehicle manufacturers and supply chain delegates attended the event to network and hear expert speakers from companies, including Toyota Motor Manufacturing UK, Applied Components Technology, Cummins Ltd and local enterprise partnership, D2N2 LEP.